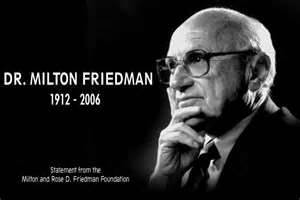 July 31st marked the 100th anniversary of birth of Milton Friedman, if he were alive. Milton Friedman was America’s most prominent economist of the 20th century, and advocate of free markets – which included educational choice. He was born in 1912 to Jewish immigrants in New York City, attended Rutgers University, earning a B.A. at the age of twenty. In 1933 he earned his M.A. at the University of Chicago and his Ph.D. from Columbia University in 1946. Friedman received the John Bates Clark Medal honoring economists under age forty for outstanding achievement. In 1976, he was awarded the Nobel Prize in economics, when such prizes were awarded for actually accomplishing something, for his achievements in the field of consumption analysis, monetary history and theory, and for his demonstration of the complexity of stabilization policy. Before that time, Milton Friedman served as an adviser to President Richard Nixon and was president of the American Economic Association in 1967. After retiring from the University of Chicago in 1977, Friedman became a senior research fellow at the Hoover Institution at Stanford University. Friedman established himself in 1945 with Income from Independent Professional Practice, coauthored with Simon Kuznets. In it he argued that state licensing procedures limited entry into the medical profession, thereby allowing doctors to charge higher fees than they would be able to do if competition were more open. In his book, Capitalism and Freedom, Friedman wrote about the most important aspects of economics of the 1960s, which made a case for free markets. He also argued for a volunteer army, free-floating exchange rates, and education vouchers. Friedman was strongly against the military draft, which at that time had been restarted since World War II for the Vietnam War. This book encouraged many students to study economics. His ideas continued to spread when he coauthored and published a book entitled Free to Choose with his wife, Rose Friedman. It was a bestseller in 1980 and made Milton and Rose Friedman popular. Milton Friedman’s work has done much to put away the Keynesian theories of economics that failed to work. This last week several events were performed in honor of this great American economist who dispelled economic myths and provided a more down-to-earth explanation in several books so all could understand the importance of free market and monetary controls. All the “Free to Choose” videos can be seen HERE. This entry was posted in American History, Milton Friedman.